I can’t believe that another November has rolled around—it’s here—it’s…tomorrow. 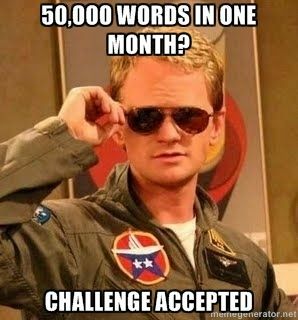 It’s time for NaNoWriMo, or National Write a Novel Month, if you aren’t familiar with it. Basically it’s a month of wreckless abandon writing, all in a feverish attempt to reach the finish line: 50,000 words. It’s month filled with coffee, too many dollar bills forked over to the Starbucks corporation, sore wrists, angry curses to the Writer’s Block Gods, and pure frustration. Don’t let that list fool you. It’s my favorite month out of the whole year. I’ve been counting down to November since August, and I can’t believe it’s finally here. This is my sixth year attempting NaNoWriMo. I hope it will be my second year winning and crossing that 50,000 word threshold. Last year, I barely crossed the 50,000 word count, with a novel I had hoped would be a suspenseful thriller/mystery. I just reread it after not touching it for a year—it’s not that good. This year, I will be trying my hand at a fantasy novel that has been in my head for several years. Fear has been holding me back—fear of what, I’m not sure. Failure? The inability to accurately convey my idea on paper? Showing my idea to other people? It’s an interesting process. Due to the sheer amount of writing I will be doing in November (an average of 1,667 words a day, to be precise), I will be taking a break from my usual binge reading. Kiesha will still be reading and reviewing, but she’s in school (*and* works full-time), so she’s pretty busy, too. To prepare for November, we’ve decided to participate in a 30 Day Book Challenge. Every day will feature a different prompt, and we’ll answer accordingly. Pretty simple. Any other NaNoWriMos out there? Let me know! I’d love to add you as a Writing Buddy.